Anders Manga is an artist, songwriter, and producer hailing from Charlotte, NC, who has released and self produced 5 albums since 2005. His music has been described as a blend of gothic rock, industrial, Dream Pop, EBM and 80’s influences into a modern, melodic electro-rock sound. Some reviewers have described it as “Gothtronica” whileAnders simply refers to it as “Electronic Rock”. Regardless of the genre you wish to classify his music, the listeners continue to grow worldwide on a daily basis. 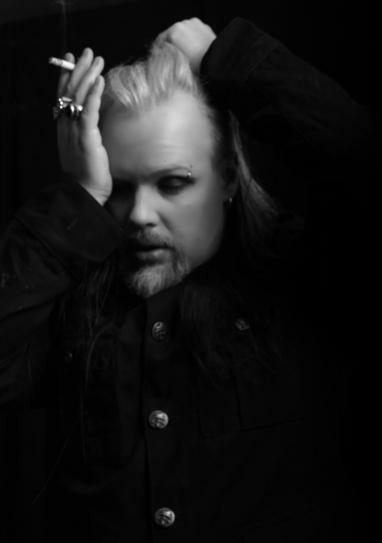 In 2007Anders was nominated for “Band of the Year” by Gothic Beauty Magazine readers alongside Lacuna Coil, Skinny Puppy, and an artist he lists as one of his earliest influences, Gary Numan. Anders has performed at many festivals and dark music events such as Convergence, The Ann Rice Halloween Ball, Black Sun Festival, Goth Stock, Eccentric Festival, Cirque Macabre, Bar Sinister and multiple performances at the infamous “Dracula’s Ball” event in Philadelphia. In 2008,Anders’ single, “There Will Be Blood” climbed to the top 20 of the German Alternative Music (or DAC) Charts, which prompted him to pursue more opportunities outside the USA. In 2009, he signed with Danse Macabre Records in Europe. His first official worldwide release “Infinite Gaze to the Sun” is expected to be released in February of 2010.